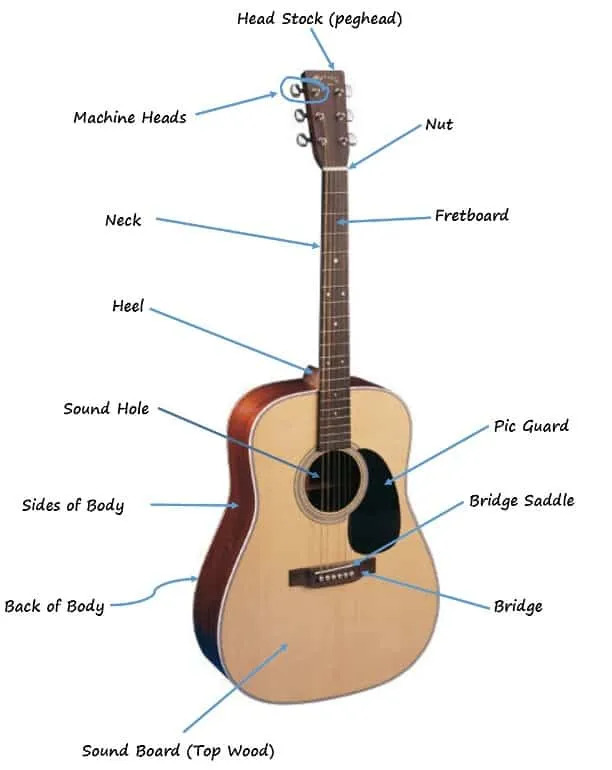 Check out the parts of the acoustic guitar diagram (larger version below) to learn the different parts of the acoustic guitar. Below the diagram there is further explanation for each of the parts. O.k. now let’s look a little bit more in depth into the individual parts of the acoustic guitar. Some of this will be a little bit technical for some or obvious for others. Headstock: The headstock is the very top of the guitar and houses the machine heads. Machine Heads: The machine heads are very important- they are the mechanisms that control the tensions of the strings. Part of the machine head is the tuning peg (or tuning knob). The tuning peg, like the name suggests, is used to adjust the tension of the string to allow you to tune the string correctly. The tuning peg turns a cog which is connected to a ‘capstan’. The capstan is what holds the string in place. There is a hole in the capstan that the string threads through and as the tuning peg is wound it turns the capstan via the gear and the string is wrapped around the capstan. Loosening the machine head (by turning it to the left) will result in a lower pitched sound. Tightening the machine head will cause the pitch of the string to go higher. The Nut: The nut is located at the intersection of the headstock and the neck of the guitar. The nut allows the strings to be raised off the fretboard and also maintains correct string spacing – so it is a very important component! The nut (along with the bridge saddle [a.k.a. bridge nut]) also controls how high above the fretboard the strings are. This is what is often referred to as the action of the guitar. A lower action means that the strings are closer to the fretboard and a higher action means that they are further away. A lower action can make the guitar easy to play but if you go too low you can end up with fret buzz. The Fretboard (a.k.a. Fingerboard): The fretboard houses the frets (see below) and this is what your fingers press against when you are playing. The fretboard is usually a separate piece of wood attached to the face of the neck and the most common wood used is rosewood. The fretboard will often have spots or some kind of decoration, known as inlays, on the 5th, 7th & 12th & 15th frets (sometimes others and sometimes less) to help with orientation of where you fingers need to go on the fretboard. 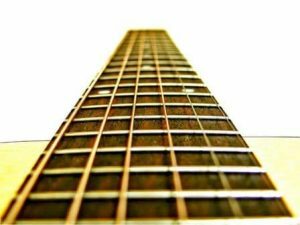 Frets: Frets are pieces of metal embedded in the fretboard. The frets control the tonality of the guitar. If you place your finger next to a fret it presses the string against that fret and essentially changes the length of the string that is able to vibrate, therefore changing its tone. There is such thing as fretless guitars but these are by far the minority. The neck: The neck of the guitar runs from the heel on the top of the body of the guitar up to the base of the headstock. The fretboard sits on the face of the neck. Necks are usually glued to the body on an acoustic guitar. Steel string acoustics and some nylon string acoustics have truss rods, which is a steel rod that runs through the middle of the neck to strengthen it. Most nylon strings don’t need this as Nylon strings don’t produce as much tension as steel strings. This is why it’s a bad idea to put steel strings on a nylon string guitar. 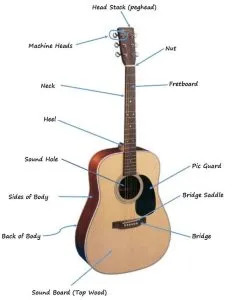 The body: The body of the acoustic guitar is made up of back, sides and top. Often the top sheet (the sound board) is made of different wood than the back and sides. The upper part of the body (closest to the neck) is known as the treble bout and the lower part is the bass bout. The waist (narrowest section in between the bouts) acts as a divider between the sections. The shape of the body can have a distinct affect on the sound of the guitar. The other factor that has a massive affect on the tone is the wood that the body is made of. Many different woods are used in the construction of acoustic guitar bodies and what wood is used depends on the ultimate price of the instrument and the desired tonal qualities. The two most common shapes of acoustic guitars are the dreadnought shape, the grand auditorium and the classical shape. The shape of the diagram above is the dreadnought shape. 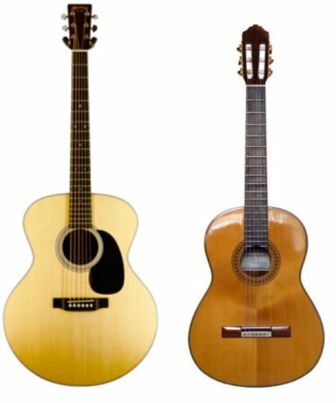 As you can see in the image below the grand auditorium shape (left) and the classical guitar (right) has a more pronounced waist than the dreadnought shape. The Sound Hole: The sound hole is not just to allow the sound to project but it is also very important for equalizing the air pressure to allow the sound board to vibrate. The Pick Guard: Some, but not all, acoustic guitars have pick guards (a.k.a. scratch plates). These are, as they sound, to protect the sound board from any damage potentially caused by a pick or fingers. The Bridge: At the “southern” end of the strings lies the bridge. The bridge is what holds the strings to the body of the guitar and transfers the sound from the vibrating strings into the soundboard. The Bridge Saddle (a.k.a. Bridge Nut): The bridge saddle, in cooperation with the nut at the base of the headstock, controls the spacing of the strings and the action of the guitar (how high the strings sit above the fretboard). The bridge saddle also affects the tone depending on the material that it is made from. Bridge pins: Bridge pins are found only on steel string acoustic not on classical guitars (nylon strings). The bridge pins hold the strings in place in the bridge of the guitar. Thanks for reading and I hope you now have a greater understanding of the parts and workings of an acoustic guitar. If you have any questions or comments please feel free to leave them in the comments section below and I will reply as soon as possible.